Do you like to juice? How about mixing some delicious fruits and veggies together? How about making a fruit and veggie smoothie that can help eliminate pain and inflammation? OKAY, LET’S MAKE THAT SMOOTHIE! In case you are curious, here’s what each ingredient does for your health! Pineapple: Supports the immune system; increases and maintains bone strength; promotes eye health; contains pain-reducing enzymes. Celery: Lowers inflammation; protects liver health; promotes weight loss; encourages digestion; is an anti-bacterial. In a study published in the journal Molecular Nutrition and Food Research, scientists conclude that – because of a molecule called apigenin, which celery contains – the vegetable reduces certain inflammatory markers. Apigenin also encourages proper immune system operations. Romaine lettuce: aids weight loss; promotes a healthy digestive tract; helps maintain bone and muscle strength; strengthens the immune system; encourages cardiovascular health. Cilantro (coriander): lowers skin inflammation; reduces cholesterol levels; treats diarrhea; stabilizes blood pressure; prevents anemia; anti-allergic properties; improves bone health; aids in digestion. Ginger: alleviates nausea; relieves pain; reduces inflammatory markers; improves respiratory function; increases appetite, relieves cold and flu; promotes heart health. Studies demonstrate that the unique compounds and metabolites contained in ginger help prevent and treat certain illnesses. The compounds gingerols and shogaols have been both researched extensively and shown to be effective. This five-ingredient smoothie recipe is potent against pain and inflammation primarily because of the ingredients’ high concentrations of anti-inflammatory properties. 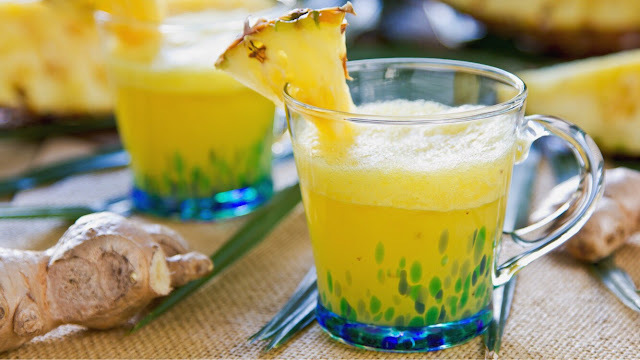 It is also worth mentioning that this drink is fantastic for maintaining healthy immune system function – particularly during the cold and flu seasons. Something that caught this writer’s attention is the rich array of vitamins and nutrients in romaine lettuce! Besides including the delicious veggie in this drink recipe, it’s worth considering as a stable in one’s everyday diet! Note: Pineapple, because of its tough and fibrous texture, may clog up your juicer. Please consider removing the skin and chopping the fruit into smaller portions if this is a concern.